Aaron Thompson brings the ball up the court. Marquette bounced Butler 76-58. Photo courtesy of Jimmy Lafakis. 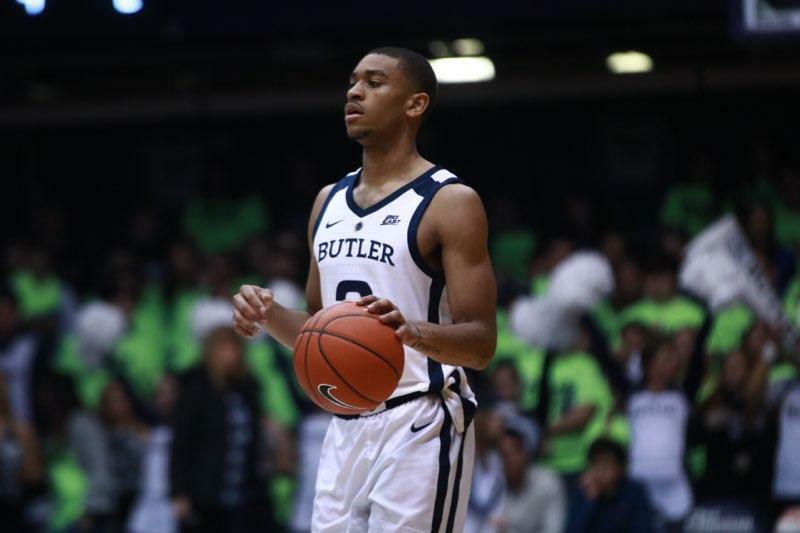 Having dropped four of their last six games, Butler welcomed No. 10 Marquette in what seemed to be a must-win to get some momentum for the rest of the season. While there was some changes in the starting five, it was not due to Sean McDermott’s knee injury. So Sean McDermott's knee must be OK. He is starting for #Butler, along with Tucker, Fowler, Thompson, Baldwin. Tonight was the annual Project 44 game, benefiting the bone marrow donor program, Be The Match. Text ‘ANDREW’ to 38470 to learn more. It's Project 44 night at Hinkle. Video message from Brad Stevens bringing a standing ovation for Andrew Smith. As for the game, both offenses started off rather slowly. And Butler’s streaky shooter in Jordan Tucker was as cold as it was outside. I can’t comprehend why we don’t try to manufacture more shots for Tucker. Markus Howard was an instant microwave, though, scoring 15 points in a five minute span in the first half. And refs seemed to be an issue in the game, go figure. Replay on the board confirms that's a terrible call on Fowler, and Hinkle isn't shy about letting the officials know about it. He gets called for more straight up fouls than anyone in the country. but there seemed to be a lack of energy that Butler teams of the past would have given any team fits, regardless if shots were falling or not. A fifth-straight NCAA Tournament bid is now looking like a thing of the past. Have to win every home game and two road games to get to .500. Ain’t happening. And Butler hasn’t been the only team in the state to lose its identity in the new year. Kamar Baldwin scored a team-high 16 points, while Markus Howard doubled him with 32. That's a final from Hinkle. The postgame press conference will be streamed live on the Butler Bulldogs Facebook page. The team will stay home to face the Seton Hall Pirates on Saturday at noon.